CanSat, literally stands for a (soda) can satellite. In the competition, a real satellite is simulated and integrated within the volume and shape of a soft drink can. The challenge for the students is to fit all the major subsystems found in a satellite, such as power, sensors and a communication system, into this minimal volume. 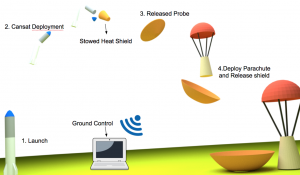 The CanSat is then launched to an altitude of a few hundred metres by a rocket or dropped from a platform or captive balloon and its mission begins: to carry out a scientific experiment and achieve a safe landing. 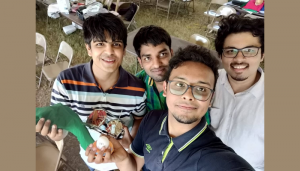 This year’s mission was to construct a satellite containing not only all the necessary electronics but also a single large hen’s egg, simulating a delicate instrument. The probe had to be launched to an altitude of 670 meters – 725 meters above the launch site and then deployed from the rocket. It had to make a series of manoeuvres to descend at a controlled rate, and finally land without breaking the egg. The main objective of the competition, which was to save the egg inside the SAT, was accomplished by the IIITH team. That was a big plus point which got them the 24th rank. In phase 1, teams submitted their applications. In phase 2 which is the Preliminary Design phase, teams developed their designs, prototype, test concepts, and generated a Preliminary Design Review (PDR) using the provided template. After PDR, the shortlisted 40 teams were invited to the competition. Phase 3 entailed critical design of the satellite. This is when teams finalized their design and started ordering components, manufacturing parts, test subsystems and start developing the flight unit. Phase 4 and 5 of the competition took place over the launch weekend. Teams were scheduled to present their completed CanSat for flight readiness review which had a time limit of 30 minutes. 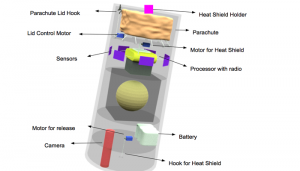 The CanSat had to be completely assembled, operational and ready to launch at this time. In the final phase or phase 5, the Post Flight Review (PFR) took place. This was a 15 minute presentation of the flight results with an additional 5 minutes for questions. Awards were presented at the end of the post Flight Reviews. The shortlisted home team, aptly named FalconX after the launch vehicles of SpaceX, Falcon Heavy and Falcon 9, comprised of 2nd and 3rd year students Vivek Jain, Alakh Desai , Adarsh Pal Singh, Aakash KT, Aditya Aggarwal, Keshav Krishna, Sai Praneeth Chokkarapu, Y V S Harish, and Pooja Srinivas. Since the entire process was supposed to simulate the real world, and a successful launch depends on teamwork and coordination, the mission had crew assignments laid out. Task assignments such as those of a Mission Control Officer, Ground Station Crew, Recovery Crew and CanSat crew were delegated. 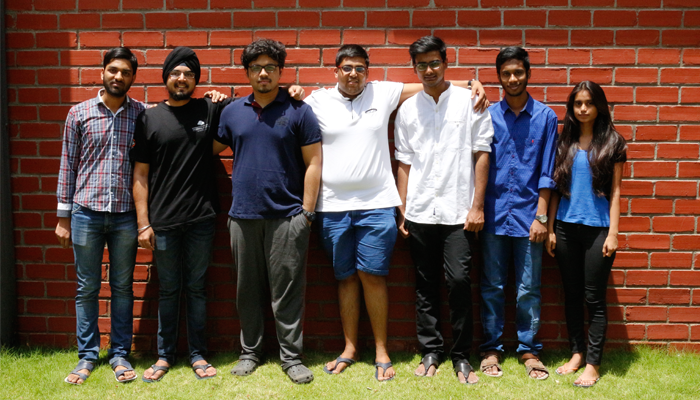 Hence only 4 of the original crew attended the launch in Texas, with Vivek Jain as the team lead and Aakash as the alternate team lead. For the last 7 years, Prof K. S Rajan has been mentoring and advising teams that apply for CanSat. This year it was handled by Prof Kavita Vemuri from Cognitive Science Lab. According to Aakash, “She had been in touch with some of her colleagues from ISRO and such companies, who agreed to guide us on selecting the right materials / other details regarding the probe. Having an expert help is always welcome!”. Apart from the base requirements for the construction of the probe, there were two selectable bonus objectives – the addition of a colour video camera and a wind sensor. 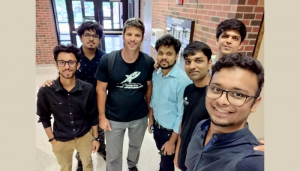 While they mounted the video camera for the probe, Aakash says that custom-designing and building a radio transmitter to transmit wind speed, seemed an uphill task. “Considering the time required and cost / feasibility of making it, we decided not to include it. The main objective of the competition, which was to save the egg inside the satellite was accomplished by us. That was a big plus point which got us this rank, “ says Aakash. In the past couple of years, IIIT-H has always had a presence in the world finals of this competition. In 2010, they emerged first and were the only team from Asia that year to qualify for the finals. 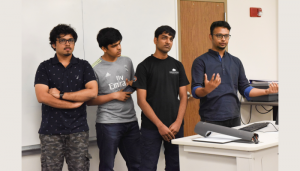 “The fact that we could overtake teams from institutes having mechanical and other core branches of engineering, speaks volumes about the quality and the exposure that IIIT-H provides. We hope to learn from our drawbacks and mistakes made in this competition, and hope to improve next time,“ signs off the team lead. All the best to this young bright talent from IIIT-H. 2018 is your year of victory. Such small satellites can do wonders.